Elvin Barker and Craig Brooks were testing fire alarms yesterday when they heard the distressed cries of mum-to-be Lyndsey Logan coming from the hospital car park. Lyndsey, who lives in Chesterfield, was minutes away from delivering her second daughter when her husband Jay drove her into the car park, and when Jay went into shock the dynamic Estates duo took over. Agreeing, mum-of-two Lyndsey said that the pair were fantastic. She added: “They got me in the wheelchair, calmed me down, told me to breathe and that the birth centre wasn’t far away. Ten minutes later the couple, who have another two and a half year old daughter called Tilley, had their second child, Emily. The newborn baby was delivered by midwife Deanna Wilson, and weighed 6 pounds 12 and a half ounces. Craig said that when the pair saw Lyndsey coming they looked at eachother and thought they had better wade in. Elvin added: “It was obvious the baby was well on the way when we found Lyndsey and our instincts just kicked-in. 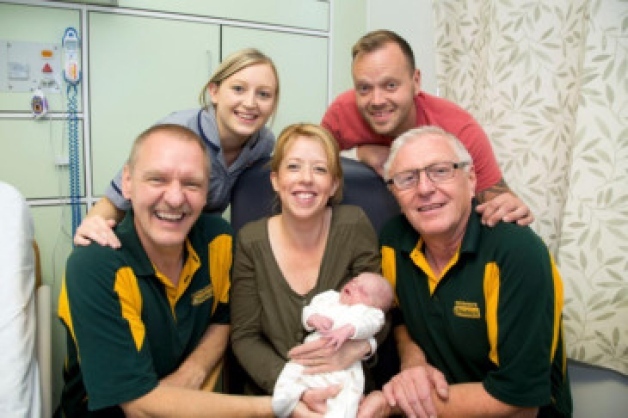 “We’re used to helping patients out when we work around the hospital, but this was definitely a special moment! Craig and Elvin both stayed to see the baby girl after she was delivered and then had to return to work as normal. They added: “We think we’ve done our good deed for the day!”.